Minimum night stay is at least 2 nights All Year Round except Public Holidays. Minimum night stay for Public holidays is 3 nights. Marlin Maison is a very special holiday home located on expansive grounds. Fully self-contained, tastefully furnished, private from surrounding properties and each other and well equipped with modern appliances. French doors open up to the sun drenched deck that wraps around the house to create wonderful indoor outdoor flow overlooking the Bay of Islands waters. 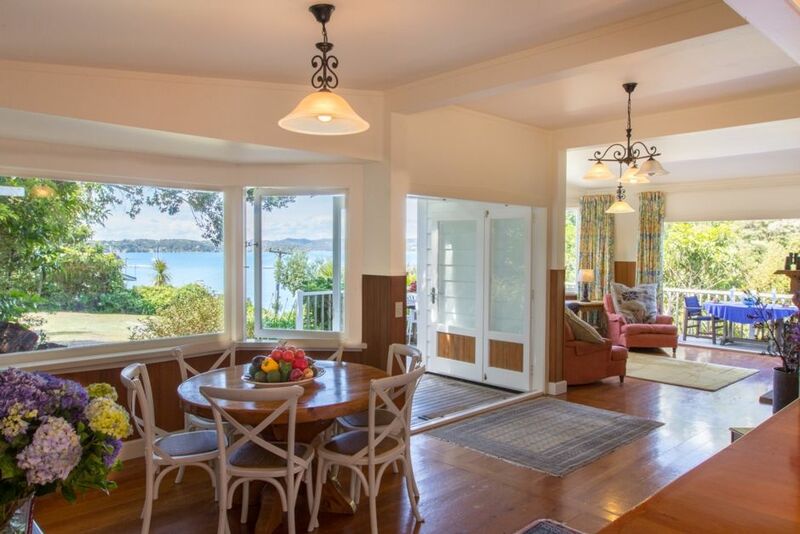 Stunning views of the Russell bay from the house and bush views from the cottage. Simply less than 5 minute stroll to the delightful and quaint colonial Russell town, boutique shops, cafes and lovely restaurants, the Russell wharf and sandy Russell beach. 10 minutes walk to an even bigger sandy bay at Long Beach. Swimming, kayaking and fishing, eating, boat rides, bush and beach walks are many of the activities to help you relax and unwind during your stay in the idyllic Russell. WELL EQUIPPED with modern appliances, linen, towels is provided and will feel like home. Extras: Cleaning on departure fee is included in nightly rate. Linen is included in your stay. Special conditions: Please put children ages 12+ as adults, No parties, No Smoking, No Tents and No Pets. We are so happy we found Marlin Maison. The house itself is charming, comfortable, clean, light and bright. The location is great - not on a busy street but an easy walk to town (2 minutes and no big hill to climb). The best thing about the cottage though is the view. It is fantastic to sit on the deck with some wine and cheese and watch the harbour boats go in and out. We enjoyed using the kayaks too. Thanks for a wonderful stay. We will be back. Enjoyed a great holiday staying at Marlin. Big house well set up ideal for the family. Well situated close to town . Such a great property to stay at with lovely open living areas and an amazing view. We also enjoyed the native wildlife, especially the cheeky Weka and its chick and the Wood Pigeons. Marlin Maison is located in a perfect position, overlooking the bay and wharf at Russell, and an easy walk into the village. Our children loved the freedom to roam into the shops and waterfront so easily. The house is well appointed, very cosy, spacious and easy to use. We especially loved the fireplace - perfect for a winter getaway. We can't wait to return in summer! Wonderful stay at Marlin Maison and Kingimoon. Wonderful stay at Marlin Maison and Kingimoon. Perfect for a pre wedding stay with my family. Amazing views and place had everything we needed as well as being so conveniently located. Thanks! This is a really special place to stay in Russell, and added a whole new dimension to our latest stay in our favourite town.